The most important law in our town is that no one crosses the border. No one comes back if they stray past it. What lies beyond is unknown. That's just how it works. Nobody asks questions or even thinks about it, it's just how it is. At least, I thought nobody thought about it, until I began volunteering at the orphanage. "The children go out twice a day for exercise and fun, but that is after the lessons," Ms. Harper guided me around the dusty orphanage as she continued to talk about the children's schedule and what I was supposed to do for them. I nodded absently, taking in the musty perfume of the floor boards and the way the faded green wallpaper tore away from the walls. Three little girls sat on the staircase with their hands propping up their heads. I smiled down at them and they stared at me curiously. I kept walking with Ms. Harper. "That's all you need to know. I just want to say how much I appreciate you helping out. You're such a dear," she said and I glanced down at the floor, feeling a bit awkward at the praise. "Thank you, ma'am. I like to help though. Since this year I turned fifteen, mum said I could finally volunteer on my own," I replied, clasping my hands together. "Well, that's just peachy!" The woman smiled. "It's the children's first time outside now that we finished the lessons before you got here. You can take them all out now." I nodded and began walking out, a line of scraggly orphans following behind me. We walked into the yard, a field of knee high long grass. The children bounced around and I watched from afar until I noticed the three girls from earlier standing together. They weren't doing anything. I strolled closer to them then kneeled down. "Hi," I greeted. The oldest girl, most likely around seven or eight, nodded her head stiffly. "Why don't you girls go play?" The girl in the middle grabbed her older sister's hand. "We don't like to, miss," the oldest girl responded with a rough accent. "Well, that's a shame. It's such a lovely day." They remained silent. I hid a frown. They weren't going to play, so maybe something more docile would work. I glanced at the youngest girl and picked up a long, pointed stick from the ground. "Do you like to draw?" I questioned. I whipped the stick through the dirt, drawing a quick flower. The youngest girl stared in awe, her brown eyes fixed on the dirt flower. "Wanna try?" I handed her the stick and she took it with eager hands. She began to etch a picture of four stick figure girls. "Who're they?" I asked her when she finished. The oldest girl stared at the drawing, her eyes widening for a split second before she kicked at the dirt, sending a spray over the drawing. I frowned. "What are your girls' names?" I was set on making friends with these little girls, they seemed like they could need it. The oldest girl frowned, shifting her weight, uncomfortable. "I'm Willie, she's Jenna-" Willie pointed to the girl in the middle. "-and she's Pansy." 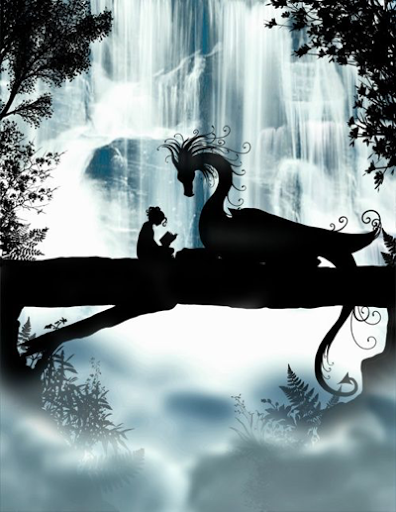 She gestured to the youngest, who was back in the dirt, creating a drawing of a snake with wings, a dragon I supposed, and a little stick figure girl reading a book to it. She was fixed solely on the drawing wonder I had unlocked for her. "Nice to meet you, I'm Catherine." "Catherine, it's time to bring the children in!" Ms. Harper called from the doorway. I spun around, getting up. "Yes, ma'am!" I replied. I called for the children to come back, when Pansy pulled on my skirt, pointing down at her drawing. It was the completed scene with squiggly trees and clouds. I gave it a quick look over and grinned down at her. She was so proud. I gathered the kids back to the orphanage and sent them to lunch with Ms. Harper. I was about to sit down when Pansy popped up. "Pansy, what are you doing here?" I asked, smiling. She tugged at my hand and pointed up the stairs. I willingly went along with her gentle lead and climbed the stairs to a thin hallway that shot past a dozen doors. Pansy led me down the hall and turned right, stopping me at a door that had three locks bolting it shut. Pansy plucked out three keys from her socks and unlocked them. She gestured for me to come into the room and I did. My curiosity was killing me. We stepped in and I looked at the room. It was just like any other room. Beige and cream paint covered the walls, four creaky beds with ragged blankets tucked into them sat there, and a side table occupied it. Turning to face Pansy, I began to ask her why she brought me here when I read the words on the back of the door. A shiver raced up my back and goosebumps laced up my arms and legs as I read them. The world's not safe anymore. I was creeped out. What did that mean? Why had it been scratched into the door? I cast a wary gaze to Pansy. "What's that?" I pointed to the door. She stared at it with a blank stare, but scrunched eyebrows. The door creaked open and Jenna and Willie came in. "What is she doing here?" Willie shouted. "Pansy took me here, I'm sorry," I replied. "You shouldn't be here," she muttered, her eyes hot with anger and sadness. I paused, then pointed back to the words on the door. "Who did that?" Everyone stayed silent as they gazed at the words. Pansy ran to Willie and whispered into her ear while I waited. I could make out her words though. Sighing, Wille glared at me, arms crossed. "You see three of us, Catherine?" she asked and I nodded. "Well, that's not how it used to be. There used to be four of us. Willie, Jenna, Pansy, and Laura. Laura was the oldest. She wrote that." "What happened to her?" I asked, my knees trembling a bit. This sounded bad. "She was always so curious about what was on the other side of the border," Willie sighed, sitting down on the floor. "She always said that she would go past it one day, but we never really thought anything of it. She was always promising things that she couldn't do. One day she got really distant and strange. She said that she needed a hero. 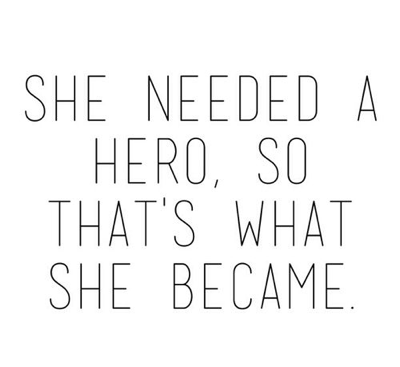 She said that she was going to be that hero. 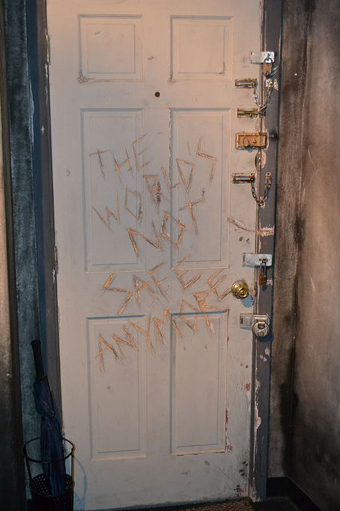 Laura scratched out the words onto our door "the world's not safe anymore" after she passed the border that day." "She crossed the border?" I gasped. That was illegal. No one came back. "Yes, and she came back for a moment, scared, irritated, and acting weirder than ever. She wrote that and then disappeared. We don't know what it means." "I'm sorry," I mumbled, overwhelmed. "We want her back," Jenna croaked, her first words that I had heard. I didn't know what to say. I couldn't bring Laura back. Or could I? 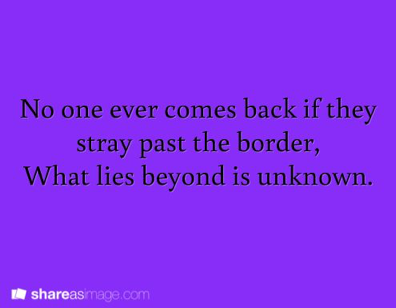 She was past the border and whatever she had discovered had frightened her. It was possible that we could go after her. I shook my head. It was still illegal, I couldn't. Screams echoed through the orphanage from somewhere outside. I raced down the stairs and gazed out the door. Ghost-like monsters pushed through the border at the edge of the town. They moved slowly, like sloths and didn't stop roaring. I reeled away from the door, bounding back to the girl's room. "There's three huge monsters coming from the border," I told them, grabbing Willie's shoulders. "I think it might have to do with that." I pointed back to the words on the door. "Do you guys have any idea what it means?" Willie's eyes widened in horror. "No," she whispered. Jenna shook her head, eyes locked on the words on the door. The silent girl slowly nodded her head. She walked over to a corner of the room and lifted the floorboard there. A box lay nestled in the ground. I snatched it up, laying it on my lap. The words "Bad memory. Do not open unless you are Willie, Jenna, or Pansy" were inked onto it. I tore it open and gazed down at the single paper inside. "Your sister wrote this," I told them as I picked it out. I began to read out loud the hasty scribbles of words. "It's June 17 and I just made the worst decision of my life. I crossed the border and I saw so much, but I know that I don't have time to write it all down. I broke the barrier. That's all there is to it. I crossed the border and that broke the barrier between our town and what lay beyond. I know the horrors of what's past it and now the horrors can get to the town. I wish I had never left, but I can't go back now. I can get the barrier back up. It just means that I won't be able to see you, my sisters, again. I'm sorry. I love you girls and I hope that when I close the barrier again everything will be okay." "We need to find her!" Willie shouted as she grasped my arm with an iron fist. I looked at her. She was counting on me. They were all counting on me. "I agree. Come on." I flew back down the stairs with the girls on my heels. I threw my cloak over my shoulders and grabbed a lantern when I noticed the sky was growing dark with storm clouds. They didn't look natural since earlier it was bright and sunny. I fetched a lantern. "Miss Catherine!" Ms. Harper screeched. "Where are you taking those girls? They need to get to the shelters!" "Sorry, Ma'am!" 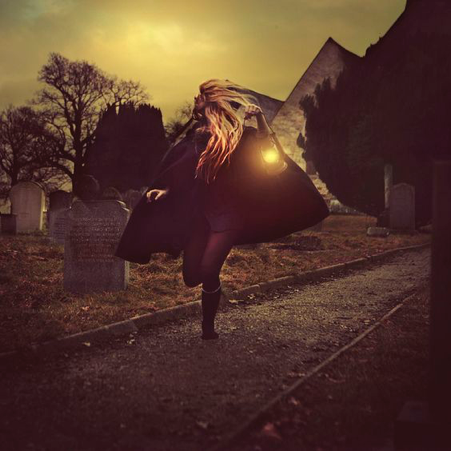 I called as we four bolted out the door, past the cemetery at the edge of the border, our hair whipping in the wind. Our boots stamped on the ground as quickly as our hearts. We were going to cross the border. We were going to find Laura.